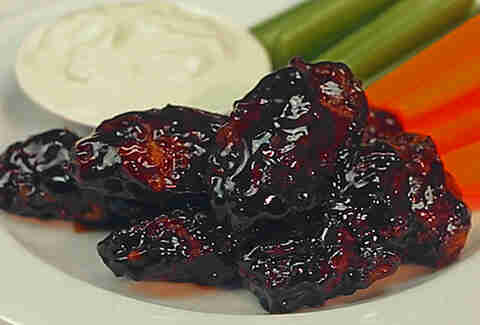 Twisted's Whiskey and Coke chicken wings take the classic combo to bold new territories. Get your napkins at the ready, because these wings are smothered in a finger lickin' good sauce made with whiskey, Coca-Cola, brown sugar, Sriracha, and a whole bunch of other spices that make these wings sing. room temperature as you can muster. Add your water to the eggs and whisk until uniform in color. seasoned flour. Turn your wing to give it a good coating then shake off the excess. Repeat with all of your wings. Get your sunflower oil up to 430ºF and fry your wings in two batches for 7 or so minutes. the oil. Bring out, drain and pop onto a large baking tray. reduce the sauce and get it nice and thick and sticky. for 3 minutes or so.